Nicole Herzog-Verrey (Zurich, 1947) studied photography at the Regent Street Polytechnic (Westminster University 1968-1970) and later graduated in Fine Arts at the Universidad Complutense Madrid (2005). After freelancing as a photojournalist in Switzerland and South America, she settled in Madrid in 1974 and made a career as a graphical correspondent for German and Swiss newspapers and magazines. Initially, Nicole Herzog-Verrey focussed her artistic career on subject matters such as her Spanish/Swiss identity (Dépaysages, 2004) and visual illusions (Metamorphoses 2006-20009). At that time she was also one of the four members of the artist's collective IOCUS dedicated to creating installations, e.g. Parque Eólico on Benicassim beach, Spain, for FIB Art (2006-2009). 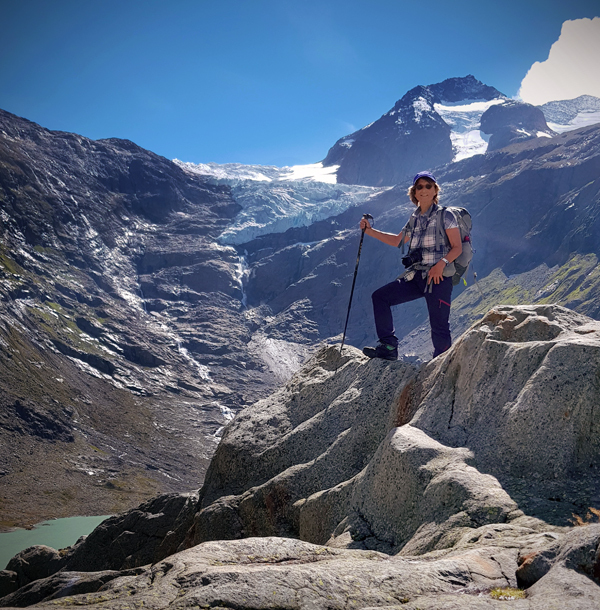 Since 2007, Nicole Herzog-Verrey’s main focus is the development of climate change, by observing its influence on the glaciers of the Swiss Alps. For her, the glaciers are terminal patients. Each year Nicole Herzog-Verrey selects and visits alpine glaciers and thus increases a photographic inventory which she then uses as fundament and inspiration for her artistic work. Nicole Herzog-Verrey has exhibited in Switzerland, Spain and abroad (Glaciers d'Effroi, 2011, Espace des Télégraphes, Lausanne, 2011 - Encontro entre mar e montanha, Casa Benet Domingo, Rio de Janeiro 2014 – Retrospective, Ateliers Sienne, Paris 2016 - Au défi de la Pierre, Photomed, Beirut 2017 - Vestige de la fin, Marc de Puechredon, Basel, 2017 and more). Her art is shown in galleries and museums (Beirut, Madrid, Lisbon, Valencia, New York, Basel, Sierre, Zurich) and at international fairs such as Shanghai Art Fair, Estampa Madrid and Kunst Zurich. Since 2012, gallerist and art critic Marc de Puechredon collaborates with the artist. Together they have produced and exhibited shows, art fair participations and artist's books such as «Glaciers d'Effroi» (2012) and now «LA FIN-VESTIGES» (2018), which presents Nicole Herzog-Verrey’s most recent work in a 21st century yet 'studioloesque' manner.